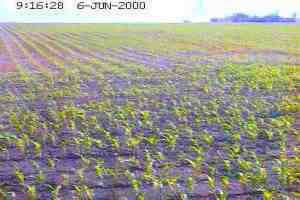 Those of you with more patience or a faster connection than I have may wish to view the Corn Cam offered by the farmers in Iowa. Tell me, though, aren't they coming dangerously close to infringing upon the "look and feel" of our beloved old Hollyhock Cam? I expect a gigantic show of outrage on behalf of all Loyal Readers!